The rolled pieces start out with a detailed drawing that is entirely made of crushed and powdered glass. The composition is developed like a reverse painting: the figures that make up the foreground are laid out with fine frit (crushed colored glass) and are then completely covered with the powdered background. I use stencils and free hand drawing to lay down these images. As in a traditional sand painting, there is no erasing or changing of the composition. The drawing is then bordered with steel and graphite and we begin to pour. It can take as many as 9 large ladles to cover a slab of 20" x 40" with about an inch of glass (example). 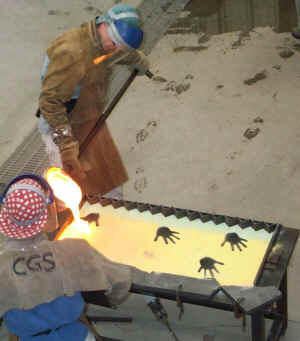 Prior to pouring the slab we have cast and puntied a disc with specific diameter. 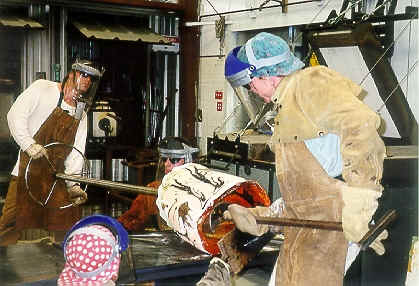 As soon as the last ladle has cleared the slab, we set and stick this disc onto the hot glass and start to roll the whole thing into a cylinder (example). We then wrestle up to 100 lb. of floppy glass back to the glory hole. 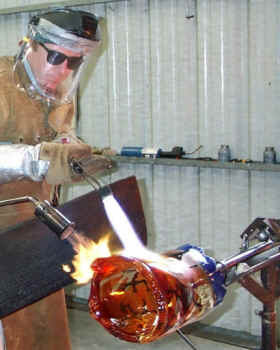 Through a lengthy process of multiple re-heats the temperature of the casting is evened out, cracks are fused and healed, and the colors are fully fired into the surface (example).